﻿﻿﻿Over the last few days I've visited two travelling Fairgrounds in my area. One, a very small one was held in Bridgford Park, West Bridgford, just up the road from where I live. 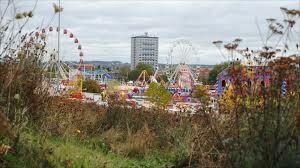 The other, one of the largest non-static Fairs in Europe, was the Goose Fair held in north Nottingham. 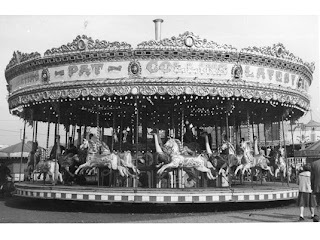 Let me recommend to you a wonderful web site on the history of fairgrounds. It is The Dingles Fairground Heritage Centre, which is based in Devon. I've said before that I'm not personally at ease in a fairground; I find them too noisy, too crowded, too expensive and too exciting (strange you might think to say this, but there must be remnants of my old Calvinistic beliefs hiding away in my bodily frame somewhere), but on the other hand, I also find them quite compelling. I acknowledge that there's something slightly schizophrenic going on here. 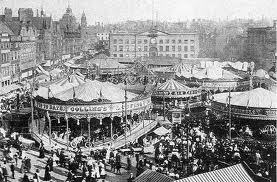 Prior to the Industrial Revolution and the advent of the more "modern Fairground", fairs, since certainly the medieval period were gatherings to sell produce. The Nottingham Goose Fair, and the Sheep Fair in Weyhill, Hampshire both go back to the 13th Century. Others were places where all sorts of goods were sold. In West Bridgford, twice a month we have a farmers market, where local produce is sold. These markets take place all over the country, and if you listen to some people, they are something new, as people have just come to take seriously the issue of 'food miles'. But haven't these markets been with us since medieval times? We haven't discovered something new; we're re-discovering something old. According to the Fairground Heritage Trust, "By the 14th Century, a huge network of chartered and prescriptive fairs had been established throughout England - the aim being to control trade revenue by the crown. Between 1199 and 1350, for example, over fifteen hundred charters were issued granting the rights to hold markets or fairs". Many would have had entertainment available in the background, such as games, curiosities, strolling players, tight-rope walkers, clowns and puppets. It was in the late 18th Century and early 19th Century that we began to see the beginnings of what we know today as the modern fairground. Up until 1928, the Nottingham Goose Fair was held in the Market Square in the centre of the city, but because of the need for re-development, it was moved to its current site at the Forest Recreation Ground. The BBC inform us that this year's Goose Fair is the 717th since it began. In looking through Goose Fair archives, I came across this wonderfully descriptive article in The Era, from the 6th October 1861. "Our great annual Goose Fair, according to time-honoured custom, was proclaimed by the Mayor with the usual formalities on Wednesday morning last, since which time, every inch of space on our great market place has been crowded to repletion with shows, booths, canvas-walled theatres, menageries, giants, dwarfs, learned pigs, double-headed calves, five-legged sheep, and double-bodied nondesripts, to the intense astonishment of such of the teetotal fraternity as can stray so far from the enticement of the market pump as to look upon the intoxicating scene and abjure 'cakes and ales' for conscience sake". Two things come to mind. Punctuation was not high on the writer's list of priorities, and get me a time-machine please, as I want to see "the learned pigs", and the "double-bodied nondescripts". Apart from making things safer, higher or faster, fairs have not changed a great deal in the last one hundred years. If I was to ask you which has been the most popular attraction for nearly 300 years, how would you answer? Well, I am asking. The answer is "The Galloper". You know the galloping horses as seen in the top picture. That's one ride I will go on, but being on your own, and without children, it make you seem a bit of a saddo. I think that it is still going strong is rather neat. What's also rather neat is that the healthy eating brigade have not got their claws into fairground food. Candy floss, hot dogs, doughnuts, burgers and chips are all still the staple requirements when visiting a fairground. Do you know what I find wonderful? That fairs are still with us today. And if you were in Nottingham on Saturday afternoon, seeing the huge traffic jams created by people going to the Goose Fair, you would know how incredibly popular it still is. Children and young people in abundance can be found at the fair, and the squeals of delight, and the screams of terror are both genuine. They are enjoying themselves. For a few hours there is no thought of Nintendo, Xbox 360, Wii, and a host of other alternative entertainment opportunities - it's the fairground that grabs the attention, and for some reason, that pleases me very much. It may not be entirely my cup of tea (though one stall did do a very passable Cappuccino), but long may the traditional fairground continue, and flourish.